I can't tell you a great deal about this particular record - other than it stinks, of course. In a month when Britain is melting - enjoying or suffering it's biggest heatwave in decades - all we need is someone praying for more sun! It seems that the poor man's singing career didn't provide enough dosh to support him and his family: when he wasn't performing he earned his crust working as a TV repair man. 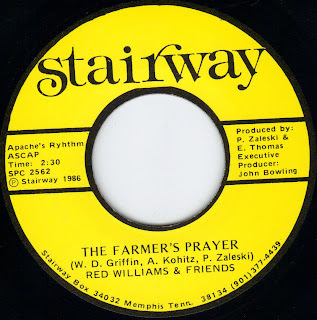 Released in 1986 on the small, Memphis-based Stairway label, the Farmer's Prayer is just horrible: oh look at us, we're dirt poor but we don't complain. All we want is a little more sunshine. Please God, help a fellow out. Bleugh! How three people have the temerity to take a writing credit for this slice of crap when it was composed around an uncredited riff stolen wholesale from Johann Pachelbel is beyond me. If anyone out there has any more info on this record please do share - otherwise, enjoy! Laurie is an awful disc. Dickey Lee’s feeble voice is reed-thin and whiny: he comes over like a spotty teen whose voice is in the process of breaking, even though Lee was fast approaching his 30th birthday when the disc was issued. But it’s also a great disc, redolent with bad taste and stupid lyrics. You’ve got to love it. Dickey Lee was no stranger to bad records. 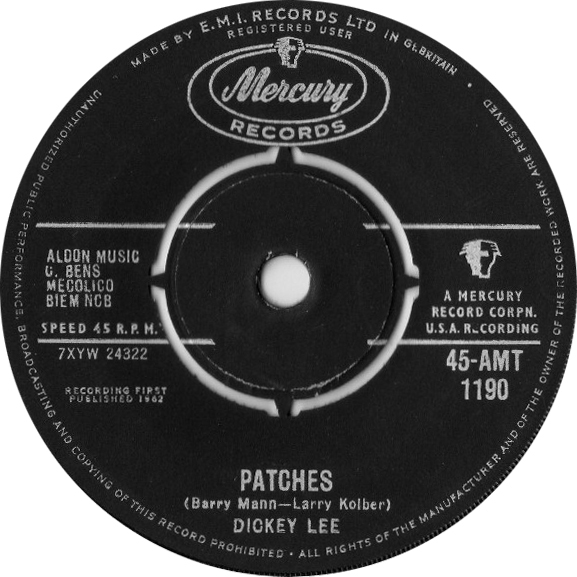 His first hit, released three years before Laurie is a miserable little affair called Patches (not to be confused with the Clarence Carter record of the same name, although in my book that’s easily as bad). With a central theme shamelessly ripped off from Johnny Preston’s hit Running Bear, Patches tells the story of a pair of lovers from opposite sides of the tracks who end up drowning – one possibly accidentally, the other on purpose after hearing of his girlfriend’s watery end. It’s another fine example of the bad taste that would blight (or enhance, depending on how you look at it) Lee’s career. Born Royden Dickey Lipscomb on September 21, 1936 in Memphis, Lee made his first recordings in 1957: his debut, Stay True Baby was issued on Tampa Records; he later moved to Sun for a pair of 45s, Good Lovin’ and Fool, Fool, Fool. While he was issuing these early sides he was studying at Memphis State University on a boxing scholarship. 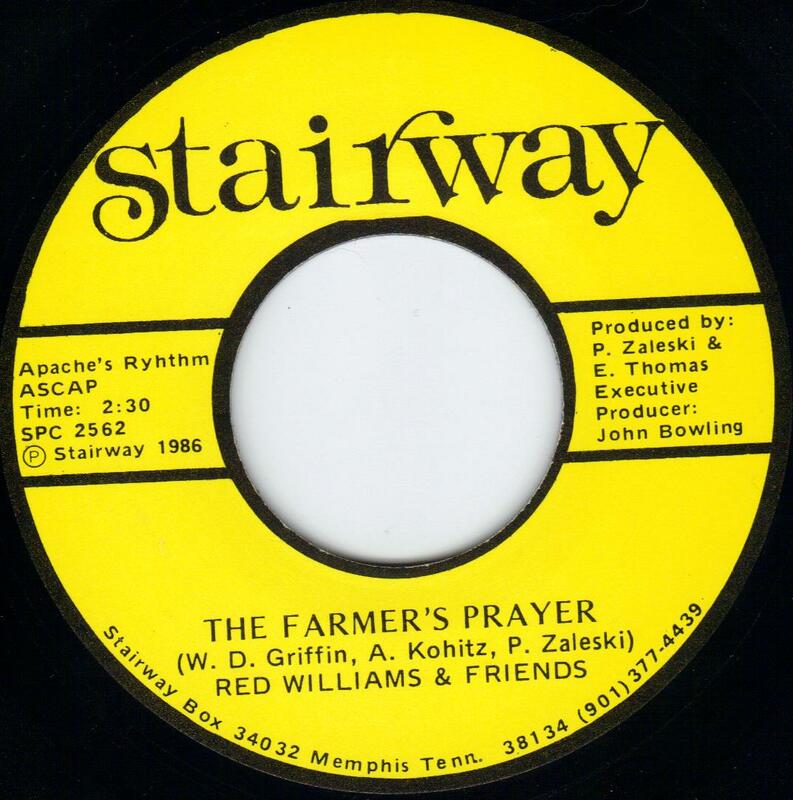 Despite his early attempt at stardom, before the success of Patches he was better known as a songwriter, having composed She Thinks I Still Care, which has been covered by George Jones, Elvis Presley, Connie Francis and many others. 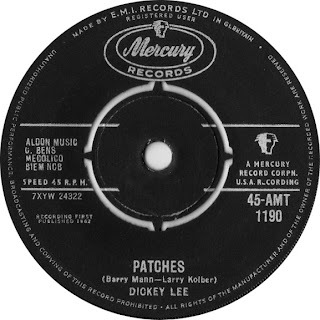 Because of the teen suicide theme, Patches was banned by a number of radio stations in the US and by the BBC. In spite of that it still went on to sell over one million copies. After Laurie, Lee would only score a brace of minor chart hits in his home country before switching styles to country. Since the early 70s he has composed or co-composed tracks for a great number of artists including Emmylou Harris, George Strait, Brenda lee, Jerry lee Lewis and Reba McEntire. He’s also had 30 hits in his own right on the US Country charts. Dickey was inducted into the Nashville Songwriters Hall of Fame in 1995. So here are Dickey’s two biggies: Patches and Laurie. Enjoy! 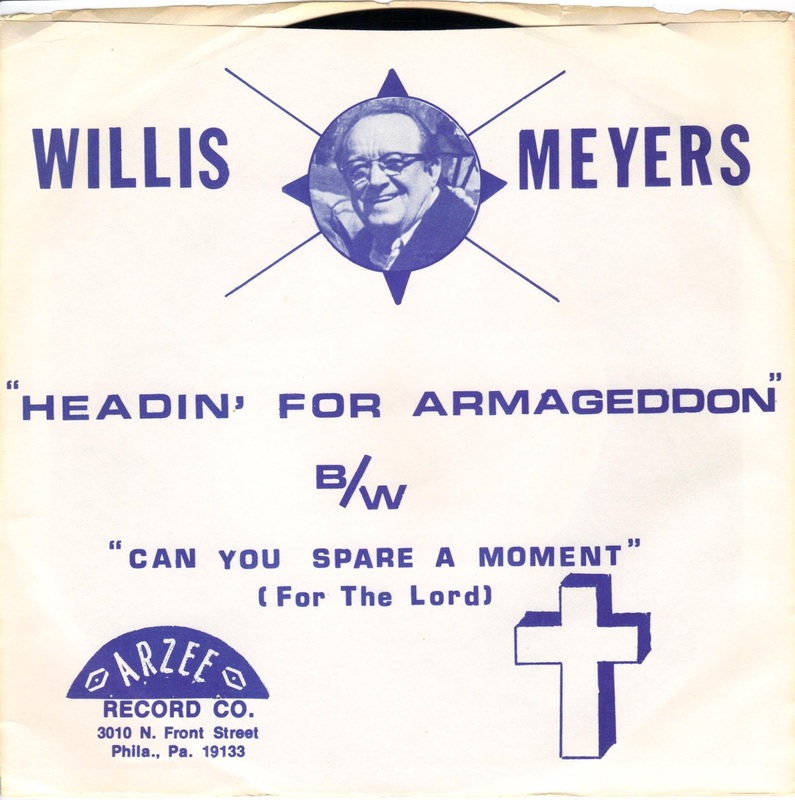 Slotting in quite nicely after last week’s Joe Meek selection, today’s offering – Headin’ for Armageddon – comes from the late Willis Meyers. A pretty naïve and rather stupid record about how only Jebus’s dad can save the world from nuclear holocaust, it’s enlivened no end by the ridiculous, sub-Meek bleeps, no doubt pasted on in post-production to simulate the sound of the world coming to an end. Willis M. Meyers (1911-1989), was a Country and Western ‘entertainer’, better known for his regular appearances on local radio than for his recorded output. Playing guitar and singing with his band, Willis Meyers and the Bar-X Ranch Boys, he could be heard on WSAN radio (Allentown, Pennsylvania) every Saturday in the late 1930s - by the mid 40s the band could also be heard on rival Pennsylvania stations WEEU and WNAR as well - and the group were a popular act at local fairs, schools and carnivals for many years. Apparently at some point Meyers, who also appeared on WSAN with the rather wonderfully-named Bunkhouse Al, had picked up the odd nickname ‘the double yodelling cowboy’, although I can only guess why. Willis was married for over five decades to Mabel (nee Musselman), who often accompanied her husband on vocals; the pair celebrated their 51st wedding anniversary just a month before his death. In addition to entertaining Willis had been a drill press operator for the U.S. Gauge Division of Ametek Inc (an international company making electric motors and electronic instruments) from 1939 until retiring in 1976. Headin’ for Armageddon and its dull B-side were put out by the Arzee Record Co of Philadelphia, owned by singer and songwriter Rex Zario (R-Z) who was born Rosario Lefavi in Italy in 1925. Zario, who passed away in 1991, had enjoyed a local hit in 1956 with Go Man Go, Get Gone, which he revamped six years later to cash in on the dance craze as Go Man Go, And Twist. Interestingly, the track was co-written by James E Myers – the co-writer of Rock Around the Clock: Meyers and Myers do not appear to have been related. However Meyers and his group were signed to, and cut several sides for, Cowboy Records in 1947, the same label that Bill Haley and his early band The 4 Aces of Western Swing were signed to. He also authored the Willis Meyers Family Hymn Book: 31 Hymns Arranged Especially for Quartets and Soloists in 1954. I’ve become a bit obsessed with Joe Meek recently. For those who aren’t already acquainted, the Newent-born Robert George ‘Joe’ Meek was the studio genius behind such hits as Telstar and Johnny Remember Me. He was also a crazed loon (his paranoia knew no bounds); quite possibly an undiagnosed schizophrenic or suffering from what we now recognise as bi-polar syndrome. Sadly Joe was unable to get the medical help he so clearly needed: using the shotgun left in his flat by his muse Heinz Burt he took his own life, and the life of his long-suffering landlady, in February 1967. Joe wrote, arranged, engineered and produced an amazing body of work: although it did not receive a full release during his lifetime (just 99 copies of one EP and 20 test pressings of the full album were ever produced) I Hear a New World, his visionary 1960 outer space opera, is now recognised as the first true concept album of the rock era. It’s a record I’ve been in love with ever since I first heard it more than 20 years ago. Over the last few weeks I’ve been reading the rather excellent biography Joe Meek: the Telstar Man, listening again to his recorded legacy and re-watching the 1991 BBC documentary about him. In short, alongside the docu-drama Telstar and other material I’ve been drowning in a sea of Joe Meek material. A lot of it is simply fantastic. Unfortunately there’s a fair amount of dross in there too, which brings me quite succinctly to this week’s record. Girl Bride was written and performed by Geoff Goddard, produced by Meek and arranged by him too (under his regular pseudonym Robert Duke). As Duke Joe composed the B-Side, For Eternity. 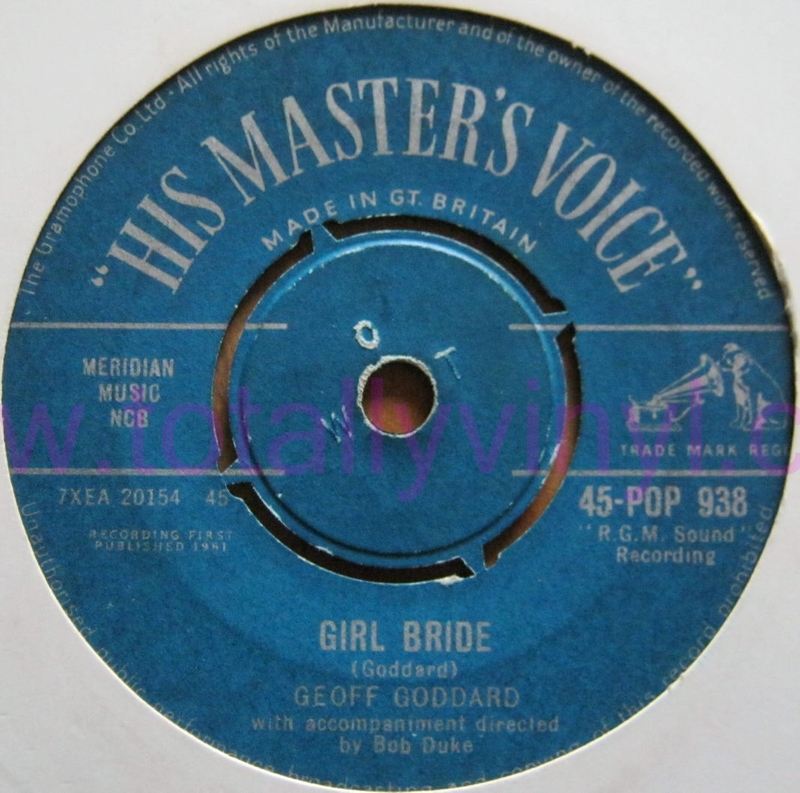 Released in October 1961 on HMV, Goddard was better known as a songwriter and musician than as a performer (although he would issue four singles under his own name between 1961 and 1963), writing Johnny Remember Me and the Heinz hit single Just Like Eddie, playing (uncredited) keyboards on Telstar and, after falling out with Meek, writing for Cliff Richard. His deep interest in spiritualism, an interest shared by Meek, influenced much of his work. The pair are supposed to have warned Buddy Holly of that date on which he would die and, once he did, have regular conversations with him from beyond the grave. Certainly a large percentage of Meek/Goddard material shows a heavy Holly influence, vis the Mike Berry hit Tribute to Buddy Holly and the hiccoughing vocal on Girl Bride. Girl Bride is a horrible song. The subject matter is dodgy, to say the least – an adult has run off with an underage girl and made her his wife despite the protestations of her family and community - and Goddard’s attempt at falsetto cannot fail to make you cringe. Unsurprisingly, and despite what other sources may claim, it was not a hit. The B-side is equally appalling; certainly not one of Meek’s better efforts. It’s hard to think how anyone at HMV could have considered Goddard as teen idol material – his voice is simply appalling. For his last 45, Sky Men (Meek was obsessed with space travel and the idea of life on other planets) Joe sped up Geoff’s voice and slapped on thick coats of echo and reverb in an attempt to disguise its weaknesses. It too failed to chart. Goddard and Meek’s successful partnership was brought to an end when Goddard attempted to sue Joe over Meek’s song Have I The Right, which was recorded by the Honeycombs and provided Joe with his last chart hit, which Goddard believed was cribbed wholesale from his own song Give Me The Chance – although, unfortunately, no recording of that song has surfaced to date so it’s impossible for us to compare and contrast the two. They would never speak again. At least not in this world. The story has it that, burned by his association with the music industry, Geoff voluntarily retired: his final job was working in the kitchen at Reading University. While there he discovered that Johnny Remember Me had been covered by Bronski Beat (with Marc Almond), had been a major hit and that there was a large royalty cheque and a platinum disc waiting for him. Geoff died in 2000: if anyone out there fancies a spot of table tapping and manages to make contact please say ‘hi’ for me. **Unfortunately Divshare is playing up (again) and has been down for a couple of days. Until this situation is sorted I'll be using Box for posting audio files here. Apologies if you have problems downloading: follow the World's Worst records on Facebook for status updates!